Public service has always been an under-appreciated part of modern society. Toiling away outside of the limelight, under-resourced, and openly criticized by the press, public, and politicians looking to deflect blame, it takes a lot of commitment and energy to serve in public administration in America. In early 2019, though, the longest shutdown in federal government history cost the economy $11 billion in lost output, did irreparable damage to numerous criminal and terrorism investigations, and drove the air traffic control system to the brink… and made it crystal clear just how important it is to have competent and educated professionals in charge of public administration. With those lessons learned, the field may be on the cusp of a renaissance in both demand and reputation. Americans want and need government that works. There’s never been a better time to launch a career in public service, and there has never been a more important time to earn a quality master’s degree in public administration to do it. Public administration draws people from all across the spectrum of age and experience. As a specialized field in its own right, getting the right education is critical, but for anyone coming in from another field, jumping through the usual hoops of college entrance exams is a tedious and unnecessary chore. That’s why we’ve identified the 16 best-priced MPA programs in the country that skip the entrance exam requirements and let you get right down to the business of serving the public good. The Network of Schools of Public Policy, Affairs, and Administration (NASPAA) is the gold standard in public service education. That’s why we started by looking exclusively at NASPAA-accredited programs. If a program doesn’t have the NASPAA stamp of approval, then the price tag doesn’t matter… it’s not worth your money or time. NASPAA is a big deal on a global scale in the world of public service. You’ll find schools from all over the world on their list of approved programs, which tells you that they approach public service education with the kind of broad-minded perspective and universal best-practices that the field demands. Their rigorous peer review process is unparalleled in examining the details and contributions of MPA programs. Unlike many accreditation agencies, NASPAA is value-driven rather than industry-driven. Their mission is to the field, not employers. That’s important because it drives their commitment to ensuring that programs contribute to the overall knowledge base of the community and engage in the unbiased research and practice of public service. Good decisions are made with good data, and NASPAA’s insistence that accredited programs establish observable goals and outcomes and follow strict truth-in-advertising rules helps you get the straight story on what each program actually offers. To this end, the Network adopts standards for faculty qualifications, student support, and administrative capacity that will ensure you don’t get derailed by poor quality instruction or a lack of resources. Public service doesn’t pay as poorly as rumor would have it, but it’s only reasonable to want to find a program that won’t leave you with a pile of debt. And the way we see it, you might as well start early figuring out how to get real results without breaking the bank – this is going to be a consideration no matter what your role in public service ends up being. But salaries aside, it’s a safe bet that even someone with your skill and drive wouldn’t be able to make as big an impact on the public good if you were working in a traditional commercial role. And at the end of the day, that’s really the appeal of getting into public service. When it came to assessing a good value, we came up with the average total tuition costs for NASPAA-accredited MPA program in each state… including the ones that required entrance exams. We only compared like-to-like… public and private universities offer different advantages and disadvantages and have different cost structures to consider, so we only stacked private schools against the private school average, and the same with public universities. The math is simple: go with one of the programs on this list and you’ll be getting a top flight, fully accredited degree at a price that is lower than the average for similar programs in your state. Once you have your budget nailed down, you will want to start thinking about differentiators. Public service covers a wide swath of specialties and interests. We list the various concentrations available for each of these programs so you can find schools that offer a deep dive into the particular specialty you are interested in pursuing. You should also consider reputation, which is why we note endorsements and rankings by other agencies or publications like the Princeton Review, Kiplinger, The Economist and Forbes. Closely related to reputation is the network and affiliations that a program has developed over the years. Who you know can be as important in government service as it is in the private sector, and we note which programs have particularly deep associations and alumni networks to draw on. Perspective is important for public administrators, which is why we also highlight schools that offer overseas experiences as part of the program. Getting a look at governance in other countries helps spark new ideas and draws important contrasts that you’ll bring to your own thinking about how to structure and organize public programs. And if you’re an accomplished professional drawn to this list by the lack of entrance exam requirements, chances are you’re also looking for a program that has flexible attendance options, like evening-oriented class schedules or online courses. We cover those features, too. What you’ll find here is a selective round-up of MPA programs – not only do they provide a clear pathway to a career in public service without jumping through the hoops of entrance exam requirements, they’re also the lowest cost MPA options available in America. Arkansas State University’s MPA, either in public management or non-profit management, offers everything you need from an advanced education in public administration: a competitive program cost, the option of online or on-campus study, and a comprehensive course of study that prepares you for management, director, and executive-level positions. This program will prepare you to be an effective leader in any aspect of public service, whether you’re interested in managing people, money, resources, or programs. Choose Arkansas State and you’ll be part of a program that’s taught by a team of committed faculty members with real-world experience. It’s no wonder the Arkansas State MPA is widely recognized as one of the top online public administration programs in the nation. The University of Arizona’s MPA is not only offered at a very competitive price, it’s also a well respected regional leader in preparing aspiring administrators like you to tackle today’s most complex social problems, whether from a position in the public sector, or with private enterprises or nonprofit organizations. Thanks to a unique blend of fieldwork opportunities, a robust curriculum, and outstanding facilities, you’ll get everything you need to enjoy an amazing student experience, and come away with everything you need to meet the demands of contemporary organizations. All courses of this program are offered in the evening, allowing working professionals to finish their degree while still meeting professional and personal obligations. And, in keeping with the reputation of this ‘Research One’ university, you can look forward to rubbing elbows with a world-class, interdisciplinary faculty. For even more opportunities, the university offers a study abroad opportunity for MPA students, allowing you to complete one year of the program in Tucson and the other year in Adelaide, Australia. California State University, Dominguez Hills’ MPA not only offers a great value in graduate education, coming in at more than $2,000 less than the state average for public administration programs offered at public schools, it offers superb convenience and flexibility through an on-campus or online delivery. Designed to meet today’s dynamic work environment through a curriculum rich in teamwork, communications, and critical thinking, CSU Dominguez Hills’ MPA prepares you to tackle the most contemporary issues in organizations. And thanks to concentrations in criminal justice policy and administration, healthcare policy and administration, public management, and nonprofit management, you’ll be able to specialize your graduate degree for a truly focused course of study that will help you carve out your niche in the area nearest to your heart. Choose the online program and you’ll work with classmates through interactive online discussions and complete your MPA in just two years. Choose the on-campus program and you’ll take two courses every semester, in the evening, finishing your degree in three years. The University of Central Florida’s MPA stands out among the best for its competitive tuition rate, the fact that it’s offered entirely online, and its stellar reputation, bolstered by national rankings for academic rigor and value from esteemed publications like U.S. News & World Report, the Princeton Review, Forbes, and Kiplinger. The MPA here is designed to prepare aspiring public servants like you with the skills and knowledge needed to create meaningful change in the public sector, thanks to a focus on strategic planning, public policy, organizational management, financial management, and more. And while this program is offered online, you’ll still have ample opportunities to get in the game through service learning and real-world experiences designed to cultivate your leadership skills and community partnerships. The University of Illinois at Springfield offers a true value in graduate education, coming in at over $8,000 less than the state average for public administration master’s programs offered at public schools. But affordability is far from the only benefit of this program. Thanks to a prime location in the state capital, students enjoy access to a diverse network of public affairs scholars and practitioners, while the comprehensive curriculum emphasizes contemporary issues like budget and finance, organizational behavior, human resource management, quantitative and statistical analysis, and policy analysis. You’ll also benefit from a faculty of experienced practitioners, optional graduate certificates that can be earned concurrent with your MPA, and a variety of paid internships with state and local government and nonprofit organizations. With a comprehensive curriculum in public management, finance, and policy highly relevant to today’s most pressing concerns, combined with a tuition rate that’s nearly $7,000 less than the state average for similar programs offered at public schools, Wichita State University’s MPA prepares you for success without breaking your budget. Choose the MPA through Wichita State and you’ll enjoy a curriculum that’s rich in policy-relevant research assignments and internships, and a faculty with significant professional experience in government and nonprofit work. It’s no wonder that this program has produced an extensive alumni network of professionals in the private and public sectors, both in Kansas and across the nation. You don’t need to sacrifice quality for value, thanks to Bowie State University’s MPA, which is priced over $7,000 less than the state average for public administration master’s programs offered at public schools. Outstanding student resources that include state-of-the-art computer labs and technology complement a rich curriculum designed to prepare students like you to become leaders in public service. Whether your interests lie in government, lobbying or nonprofit work, the MPA is designed to support you in the pursuit of your professional goals. This program also offers the opportunity to customize your studies by selecting a human resource or public policy and management concentration. Choose Bowie State for your MPA and you’ll be part of one of the oldest historically black universities in the nation, ranked by the Economist and the Wall Street Journal as first in Maryland for value and academic rigor. Since 1969, Northeastern University’s MPA has been preparing students to serve the public good—all at a cost that’s nearly $10,000 less than the state average for public administration programs offered at private schools. In addition to a curriculum that emphasizes competencies in budgeting, human resources, organizational management, and leadership, this program features outstanding opportunities for hands-on learning through internships, small group projects, and unique interactions with professionals in the field. As a student here, you’ll also benefit from a highly skilled faculty that’s committed to helping you secure internships as a student, and employment once you graduate. And when you step out into the world as a Northeastern alumnus, you’ll be part of an extensive professional network that includes more than 3,000 partners and more than 200,000 alumni around the world. You can also take advantage of Northeastern’s signature Cooperative Education Experience, which offers six-month full-time research and work rotations in nonprofit, public, and private organizations in Greater Boston and across the country. At nearly $7,000 less than the state average for public administration master’s programs available at public schools, Eastern Michigan University’s MPA offers the affordability you’ve been looking for, without you having to compromise anything to get it. Offered as both a full- and part-time program, the MPA is fully customizable, allowing students like you to specialize in local government management or nonprofit management or designed your own unique specialization by choosing among a set of electives. Thanks to a variety of working relationships with other programs on campus, the Department of Political Science is able to offer students the option of designing an interdisciplinary course of study. Eastern Michigan is also home to a large selection of graduate certificates that can be completed alongside your MPA for a truly customized course of study. The Minnesota State University Mankato MA in Urban Studies is a unique, interdisciplinary degree that’s designed to examine a broad range of issues affecting both urban and rural areas. This program features a competitive tuition that comes in at nearly $10,000 less than the average for public administration master’s programs offered at public schools, along with a flexible curriculum that prepares students for careers in local government or for study at the doctorate level. This flexible program allows you to complete some courses online or through a hybrid mode of delivery. You’ll also enjoy a wide variety of service-learning opportunities here and the opportunity to study abroad in Ghana, West Africa. You can even earn a graduate certificate alongside your degree for an education custom tailored to fit your interests and career goals. Seton Hall University’s MPA stands out even among the very best master’s programs in public administration, thanks to its competitive program cost (more than $11,000 below the state average for public administration programs offered at private schools) and its national ranking among nonprofit management programs by U.S. News & World Report. In addition to this program’s comprehensive curriculum that prepares you for a variety of leadership roles in public service settings, you’ll enjoy the flexible course schedule that includes year-round courses offered on-campus and online. You’ll also have the opportunity to customize your MPA through your choice of concentration, or pursue a dual degree MPA/MA in Diplomacy and International Relations. Binghamton University’s MPA impresses with its program design and for the exceptional value it offers, priced at nearly $2,000 less than the state average for public administration master’s programs offered at public schools. Thanks to collaborative efforts with community-based organizations, students of Binghamton’s MPA are exposed to real-world experiences that prepare them to become leaders and innovators in public and nonprofit sectors. Choose the MPA here and you’ll be able to customize your course of study by choosing a dual degree, double degree, or graduate certificate—the choice is yours! As a student here, you’ll be exposed to plenty of hands-on learning experiences, including the Philanthropy Incubator, a unique program that gives students the opportunity to work through community issues and distribute grant money to local nonprofit organizations. The Department of Public Administration also hosts a number of study abroad experiences to places like Malawi and Peru. A competitive tuition rate…the option to customize your degree…and exciting opportunities for hands-on learning experiences are just the beginning of what Portland State University’s MPA offers. In addition to a well-rounded curriculum that emphasizes public administration ethics, theory and behavior, law and policy, and more, the MPA provides students like you with the opportunity to choose a field of specialization that best matches your academic and professional interests. Throughout this exciting course of study, you’ll work closely with expert program faculty while you engage in community learning experiences. Portland State has earned a national reputation for its focus on community service and engagement, largely due to the Mark O. Hatfield School of Government, which has cultivated unique partnerships with community organizations, governmental agencies, and health and human services departments across Portland and throughout the country. The University of South Dakota’s MPA offers a truly affordable course of study that prepares you to serve at all levels of government and in nonprofit organizations. This program has plenty to brag about: a ranking among the nation’s top public administration programs by U.S. News & World Report…exciting internship opportunities with the U.S. Congress and South Dakota State Legislature…an extensive network of more than 5,000 alumni and community partners throughout the world…outstanding opportunities for hands-on learning through participation in events like the Model United Nations conferences and the center for the study of presidency conferences…and study-abroad opportunities to places like Turkey, Ireland, and Italy. 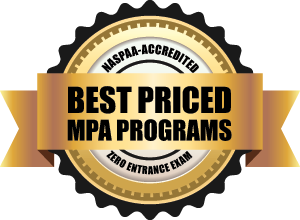 Texas A&M International University’s online MPA has made a name for itself for providing an exceptional value. At more than $8,000 below the state average for public administration master’s programs offered at public schools, and a reputation for preparing future leaders and innovators in the public and nonprofit sectors, it’s easy to see why. Since 2001, the MPA degree at Texas A&M International has been committed to innovative teaching, research, and community engagement, preparing students to value public service while enhancing their professional knowledge and skills. Offered in a fully online format, the MPA here allows you to earn your graduate degree whether you’re right here in Texas, or on the other side of the world. And while this program is completed at a distance, you’ll have ample resources available to support your learning, including a nationally and internationally recognized faculty and full access to the entire Texas A&M system, which includes online library access to millions of articles and books. It’s no wonder Texas A&M International is ranked among the ‘Best U.S. Colleges for Economic Mobility’ by Washington Monthly. Virginia Tech’s MPA is both affordable and convenient, offering up a rigorous course of study that also meets the demands of today’s discriminating grad students. Offered at the university’s three locations—Blacksburg, Alexandria, and Richmond, the MPA features an intimate learning environment in a classroom setting. Choose the MPA here and you’ll receive a well-rounded course of study that places a focus on three key areas: management, public service, and public policy. You’ll also be able to specialize your degree by selecting from nine electives or by choosing a CPAP graduate certificate. Virginia Tech has long been recognized as a leader in graduate-level education, and its MPA is no exception, earning a spot among the top public administration/management programs in the nation by U.S. News & World Report. Just a few of the other points that make this program stand out from the competition include: the option to complete the program on a part-time or full-time basis…a low 9:1 student-to-faculty ratio…and exciting internship opportunities at organizations like the Virginia General Assembly, the Virginia Office of Government Relations, and the VT Graduate School.